Hundreds of years after our civilisation was destroyed, a new world has emerged in 'Mortal Engines'. A mysterious young woman named Hester Shaw (Hera Hilmar, 'Anna Karenina') leads a band of outcasts in the fight to stop London - now a giant predator city on wheels - from devouring everything in its path. Based on the award-winning book series by Philip Reeve, 'Mortal Engines' is the epic adventure directed by Oscar-winning visual-effects artist Christian Rivers ('King Kong'). Joining Rivers are 'The Hobbit' and 'The Lord of the Rings' trilogies three-time Academy Award-winning filmmakers Peter Jackson, Fran Walsh and Philippa Boyens, who penned the screenplay. The 'Mortal Engines' competition has now closed. Winners will be announced shortly. Competition opens at 5pm AEDT on Sunday 17th March 2019 and closes at 11:59pm AEDT on Sunday 24th March 2019. Five winners will be chosen at random on Monday 25th March 2019. To successfully win, entrants must fulfil the above entry conditions before the time the competition closes. Current members/followers are eligible to enter the competition. Only one entry per person. Only one winner per household. To be a valid winner, the entrant must not have won a prize from SWITCH within the last 28 days. Each winner will receive one Blu-ray copy of 'Mortal Engines'. By entering, you agree to receive occasional emails from SWITCH in the future. If you decide to unsubscribe from these updates, any further entries will not be applicable. Only Australian residents are eligible to enter. 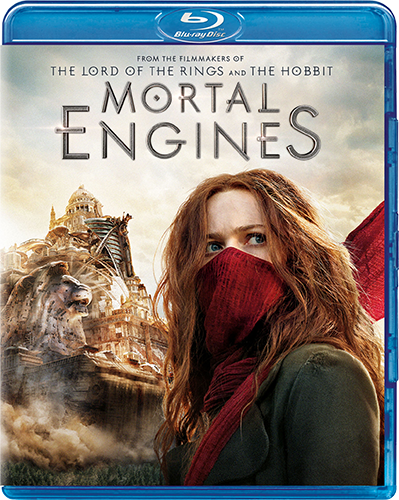 'Mortal Engines' is available on 3D Blu-ray, 4K Ultra HD, Blu-ray, Digital and DVD on Wednesday the 20th March 2019 from Universal Sony.